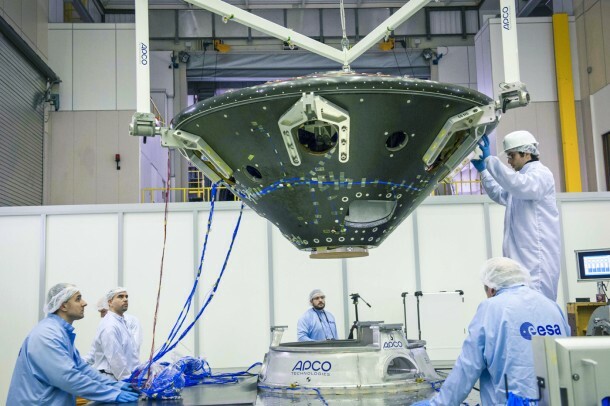 The entry, descent and landing demonstrator module that will fly on the 2016 ExoMars mission has been named ‘Schiaparelli’ in honour of the Italian astronomer Giovanni Schiaparelli, who famously mapped the Red Planet’s surface features in the 19th century. ExoMars is a joint endeavour between ESA and Russia’s Roscosmos space agency, and comprises two missions that will be launched to Mars in 2016 and 2018. 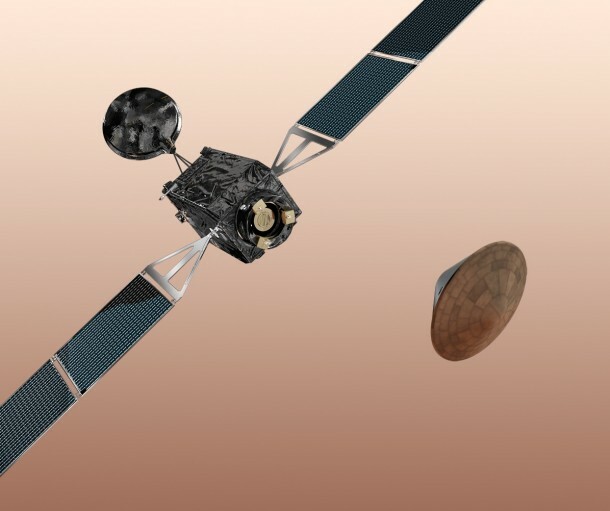 The Trace Gas Orbiter and Schiaparelli make up the 2016 mission, while the ExoMars rover, with its carrier and surface platform, will be launched in 2018. Working together, the orbiter and rover will search the planet for signs of life, past and present. Schiaparelli will prove key technologies for Europe with a controlled landing on Mars. 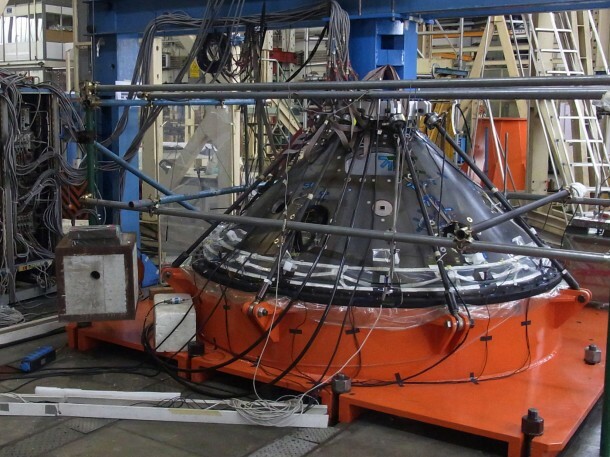 It will enter the atmosphere at 21 000 km/h and use parachutes and thrusters to brake to less than 15 km/h before landing less than eight minutes later. The module will collect data on the atmosphere during the entry and descent, and its instruments will perform local environment measurements at the landing site, which is in a region of plains known as Meridiani Planum. “Considering the importance of Giovanni Schiaparelli’s pioneering observations of Mars, it was an easy decision to give his name to the ExoMars module that is paving the way to the further exploration of the Red Planet,” says Alvaro Giménez, ESA’s Director of Science and Robotic Exploration. The name was suggested by a group of Italian scientists to the president of the Italian space agency, who then proposed it to ESA. Italy is the largest European contributor to the ExoMars programme. Giovanni Virginio Schiaparelli (1835–1910) was an accomplished scientist who dedicated much of his career to cataloguing and naming the surface features of Mars. During the ‘Great Opposition’ of 1877, when Mars was relatively close to Earth, he surveyed the planet by eye through a telescope and sketched a network of linear features that he saw running across the surface. He assumed that these were natural water-filled channels and used the equivalent Italian word, ‘canali’. This term was often translated into English as ‘canals’, leading to considerable speculation about whether a network of artificial watercourses had been excavated by an intelligent civilisation on Mars, perhaps for irrigation purposes. However, many of the linear features seen and drawn by Schiaparelli and others, most notably Percival Lowell, were argued to be optical illusions resulting from observations by eye. Later photographic images of Mars did not show them and the arrival of the first space probes at the planet in the 1960s confirmed it to be the cold, dry place we know today. Nevertheless, as a result of further space exploration, including ESA’s Mars Express, we also now know that, deep in the Red Planet’s past, water did flow freely in naturally-formed rivers and valleys, in some way vindicating Schiaparelli’s original hypothesis. He also set a precedent for documenting features on planets, and many of the names he proposed for the major landscapes of Mars are still in use today. Schiaparelli is also well known for working out that regular annual meteor showers emanating from specific regions of the sky are due to Earth’s orbit intercepting trails of debris left by comets as they make their way through the Solar System. He also made accurate measurements of the rotation periods of Venus and Mercury and was a strong believer in the importance of science popularisation: he wrote books on astronomy and often gave public lectures. “Schiaparelli’s dedication to planetary science and to the communication of science was recognised worldwide and, as such, we want to celebrate his achievements by naming a key part of the ExoMars mission after him,” says Rolf de Groot, Head of the Coordination Office for the Robotic Exploration Programme at ESA.